In its own “scorecard”, the City of St. Petersburg claims its residential recycling program generated “savings” of $518,921 during the last year (August through July). However, the program actually costs residents $2.5 million dollars per year. The Guardian made a public records request to the city and asked, among other things, for records showing “the cost per month to operate the city recycling program”. The city’s response to the Guardian’s public records request can be seen here. Lynn Arthur, Assistant Sanitation Director for the City of St. Petersburg, confirmed that recycling doesn’t pay for itself. She added that the city does not make a profit on the program, as some people have charged. “We are not allowed to make a profit on this program”, Arthur said. 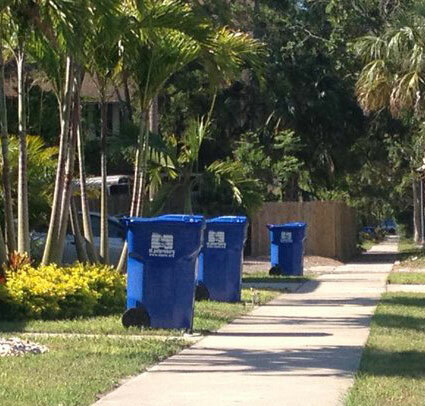 Love them or hate them, the City of St. Petersburg blue 95 gallon recycling bins have become iconic, and emblematic of recycling. But is the program really accomplishing anything? The Guardian reports, and the reader decide. Through the recycling program, the city “diverts” approximately 13,000 tons per year of what it calls “refuse” (a.k.a. “garbage”) from being sent to the only landfill in Pinellas county. That landfill is managed by Pinellas County government, which charges $37.50 per ton in what it calls “garbage disposal fees”. 85% of the garbage sent to the landfill is burned at a processing facility for electric generation, the rest is put into a landfill together with the ash from the incinerated garbage. However, the 13,000 tons per year being diverted from the garbage stream is less than 5% of the 296,000 tons of garbage the city manages per year. In fact, the 13,000 tons is less than the 20,000 ton increase in the annual amount of garbage in the last decade. The city pays Waste Solutions (formerly Progressive Recycling) $20 per ton to take the materials picked up through the recycling program. Waste Solutions then pays for the recyclable material it’s able to recover, and deducts the $20 processing fee. The process has resulted in net payments to the city of just $95,172 over the last year. The recycling program cost recovery rate from all “savings”, i.e. sale of recyclables and diversion, is below 20%. The other 80%, which amounts to a $2.5 million annual shortfall, is largely made up by the $2.95 per month it charges residents for the recycling bins. In its internal calculations, the city uses the number 76,000 as the number of billable recycling bins (the “blue bins”). Multiplying by $2.95 per month, that results in $2.2 million per year, which is still below the size of the program shortfall. The city’s $2.95 per month pricing is what is called psychological pricing or “charm pricing”. People will perceive a price of $2.95 as being $2 rather than $3. We asked mayor Kriseman why the city charges $2.95 per month and not $3, especially given the program shortfall. 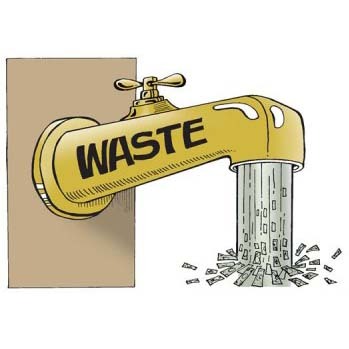 No audit has been done of Waste Solutions to make sure that the city is receiving the payments it is contractually entitled to, but Arthur said that the city can perform such an audit if it wishes to. What has been performed is a “composition study” to see what is in the recycling stream, and Arthur says such studies are a lot of work and expense. Arthur says the city has no plans to make recycling itself mandatory. In those places where mandatory recycling has been introduced, enforcement has been done through “garbage police” who may go through your garbage to make sure you are not throwing out material that by law is required to be recycled. In January, a Tampa Bay Times headline proclaimed “St. Peters­burg’s recycling program bests ex­pec­ta­tions“. But the article failed to examine the full economics of the program. The city’s decision to go to alley pickup, in the face of citizen protests at street pickup, was described in the article as an “applause line” for mayor Kriseman. However, mayor Kriseman was aware of staff’s decision to prioritize lower operational costs by using “one man, one truck” for street pickup over alley pickup. Alley pickup means “three men, one truck” and thus higher costs. When asked why the mayor changed his mind on street pickup vs. alley pickup, Kirby said “the mayor listened to the people of the City of St. Petersburg…..it made sense to move recycling collection to alleys [in places where alley trash collection is already in place]. Picking up recycling in the alley for residents who also have alley trash collection will make recycling more convenient and, hopefully, increase the number of residents participating in our program. To get the recycling program off the ground, the city purchased specially equipped sideloading trucks for automated pickup. They cost $290,000 each, and those trucks intended for alley pickup at 31,000 of the 76,000 residences will have to be repurposed or sold. Last October, the city council approved spending $1.1 million for new recycling trucks that can go down alleys. These trucks will still require three men per truck. Additional initial costs include the blue bins, which cost approximately $50 each. Thus the city spent approximately $3.8 million buying these bins. Kirby said that “the city plans to continue the recycling program indefinitely”, even if it continues to lose money. “We are incredibly pleased with the participation rates, which have exceeded projections”, said Kirby. As seen in the city’s own scorecard, the “participation rate” is not the same as the “set-out-rate”. The set-out rate is the percentage of people who put out their bin each week, and that number stands at just below 50%. The participation rate, which is not defined on the city website, will always be higher than the set-out rate, which is presumably why city officials prefer to use that term. St. Pete art history teacher Marisa Dalla Valle was an early critic of the recycling program. “The bright blue bins are aesthetically offensive”, said Dalla Valle, who lives in Midtown. She returned her recycling bin to the city and instead drops off her recycling at a local dropoff point. 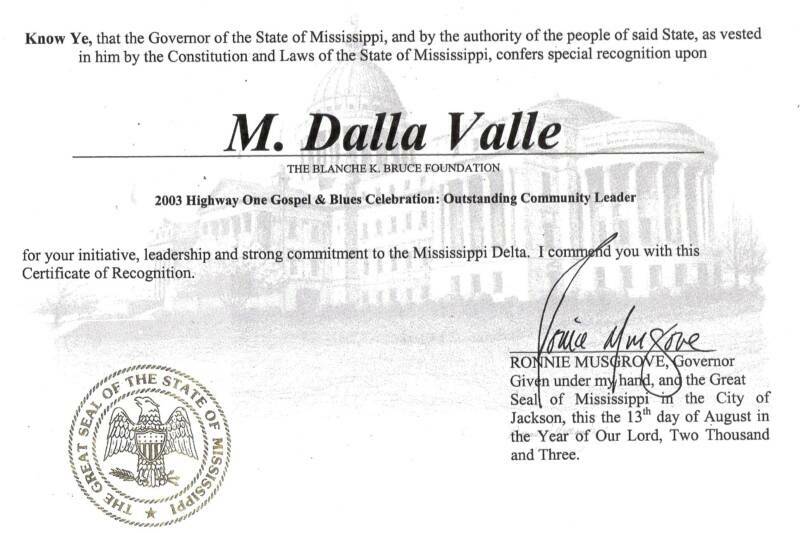 Dalla Valle sent a strongly worded e-mail to the mayor last year, not knowing it would be in the public record. “I apologized to the mayor for my choice of words”, said Dalla Valle, who continues to question the wisdom of the program. “Big trucks burning fuel to pick up the recycling – how is that ecological or cost-efficient? I’m totally for recycling and was one of the people who helped start Earth Day in Sophia Antipolis in the South of France, but in a way that was cost-efficient and not offensive” , continued Dalla Valle. She says she may make a movie called “St. Petersburg Blues” to document what the presence of the bins around the city does to its appearance. New York-born Dalla Valle says she fell in love with St. Petersburg and moved here in 2011 after living most of her life overseas. One of her pursuits now is producing and selling eco-friendly papier-mâché burial urns which dissolve in the ground over time. Do citizens realize that they are covering 80% or more (depending on how you look at it) of the program cost? In its present form, is the recycling program well-run? As always, the Guardian reports and the readers decide. This article is very short sighted, one sided, and poorly written in that it lacks a basic understanding of how municipal recycling programs work, perpetuates the myth that recycling programs should be self funding, and relies heavily on the opinion of one disgruntled St. Petersburg resident. I expect better from the Guardian and would strongly encourage a follow up article to provide your readers with better information on the economic value of the many benefits associated with recycling including: resource conservation, increased job creation from recycling compared to traditional waste disposal, reductions in green house has emissions from curbside recycling even despite the additional collection vehicles required, and reduced pollution associated with using recycled materials as manufacturing feedstock compared to virgin raw materials. In short, the author is barking up the wrong tree just to stir the pot. Very, very disappointed.